Ronald W. Rousseau holds the Cecil J. “Pete” Silas Endowed Chair at the Georgia Institute of Technology and is chair of the School of Chemical & Biomolecular Engineering. He also has served two terms as interim director of the Institute of Paper Science & Technology at Georgia Tech. He was a faculty member at North Carolina State University, a visiting professor at Princeton University, and received his B.S., M.S., and Ph.D. from Louisiana State University. Dr. Rousseau is co-author of Elementary Principles of Chemical Processes (Wiley 1978, 1986, 2000), a text used internationally and by more than 80% of the chemical engineering programs in the United States; he also is editor of the Handbook of Separation Process Technology (Wiley, 1987). His research has explored numerous areas related to separation processes and resulted in more than 190 journal articles, book chapters, and monographs and more than 250 presentations at technical meetings and seminars for industry and universities. For his contributions to chemical engineering education, Dr. Rousseau received the Warren K. Lewis Award from the American Institute of Chemical Engineers (AIChE). He also received the Clarence G. Gerhold Award from the Separations Division of the AIChE and the Forest Products Award given by the Forest Products Division of AIChE. He is a fellow of both AIChE and the American Association for the Advancement of Science and was selected for the LSU Engineering Hall of Distinction. On the occasion of the AIChE Centennial, he was cited by AIChE as one of 30 authors of groundbreaking chemical engineering books. In January 2010, he was awarded a Docteur Honoris Causa by L’Institut National Polytechnique de Toulouse. At the 32nd annual meeting of the Council for Chemical Research (CCR), Dr. Rousseau received the 2011 Malcolm E. Pruitt Award in recognition of his outstanding contributions to research progress in the chemical sciences and engineering. Dr. Rousseau is an executive editor of Chemical Engineering Science and topic editor for Crystal Growth and Design; he has been a member of the advisory board of the Wiley Series in Chemical Engineering and of Separations Technology, a consulting editor for the AIChE Journal, an associate editor of the Journal of Crystal Growth, and a member of the publications board of Chemical Engineering Education. 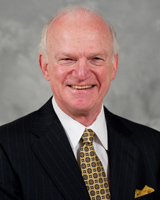 Through several leadership positions, Dr. Rousseau has made important contributions to AIChE, most notably as a member of the board of directors; as chair of the publications committee; as chair of a local section and of the Forest Products Division; as a founding member and director of the Separations Division; as a member of both the Career and Education and the Chemical Engineering Technology Operating Councils; and as a member of special task forces on publications, on continuing education, and on organizational structure. Dr. Rousseau has also served as chair of the Council for Chemical Research, an organization that at the time of his leadership consisted of top research officers of more than 35 major chemical companies and 8 federal laboratories and the heads of nearly all PhD-granting chemical engineering and chemistry departments in the U.S.
Dr. Rousseau’s leadership of the School of Chemical & Biomolecular Engineering at Georgia Tech has guided it into new domains such as microelectronics, biomolecular engineering, and nanotechnology, while at the same time enhancing core competencies in separations, catalysis, process systems engineering, thermodynamics, and molecular modeling. Much of his recent effort focuses on challenges associated with growing global energy demands and the associated impact on the environment and natural resources.